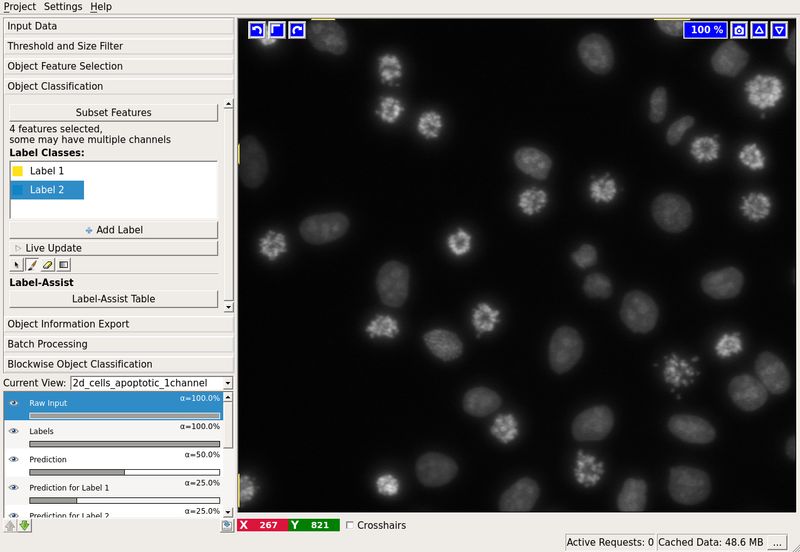 In the current version of ilastik, computations on the training images are not performed lazily – the entire image is processed at once. 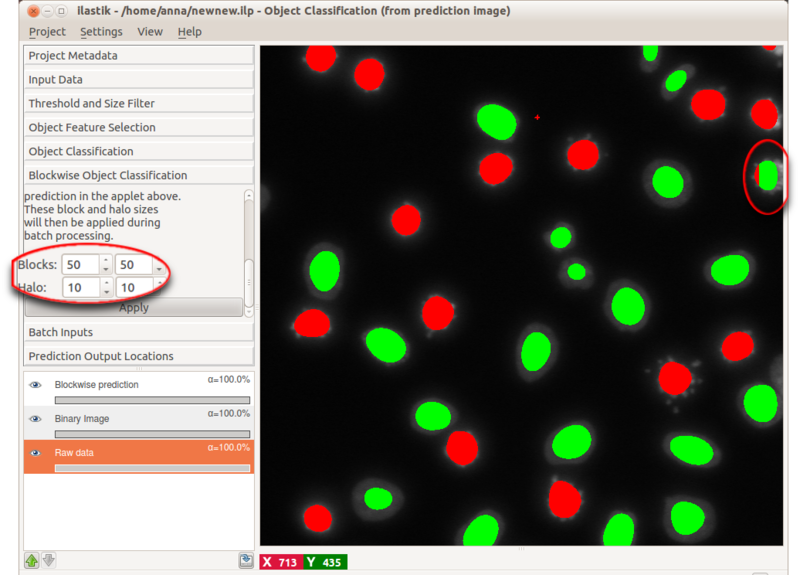 This means you can’t use enormous images for training the object classifier. 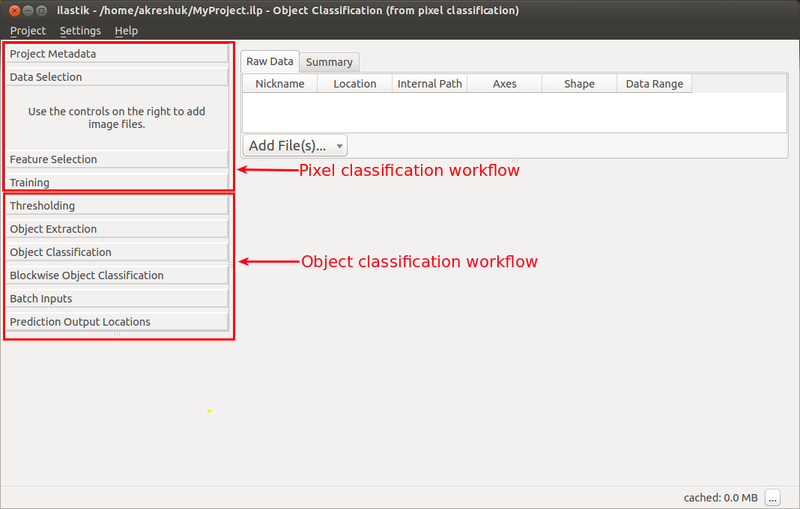 This is a combined workflow, which lets you start from the raw data, perform pixel classification as described in Pixel Classification workflow and then thresholding the probability maps to obtain a segmentation. 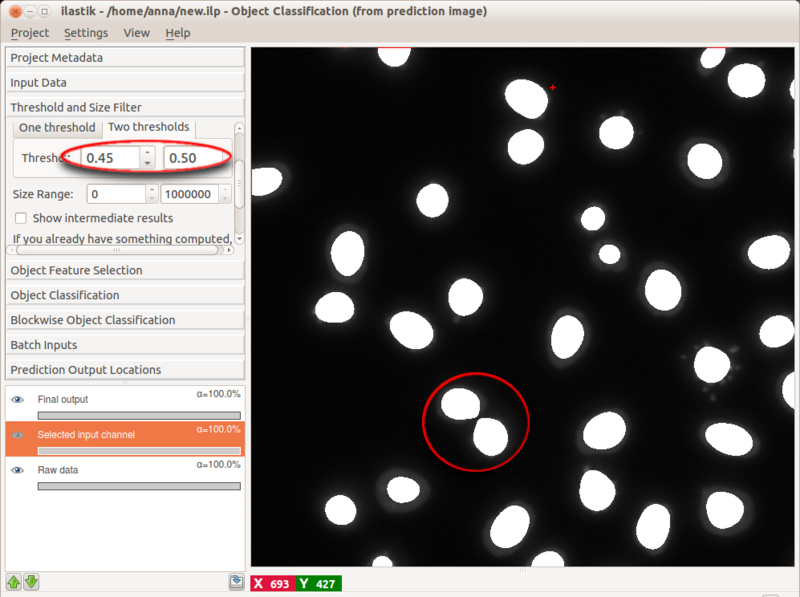 If you already have binary segmentation images, skip this section. 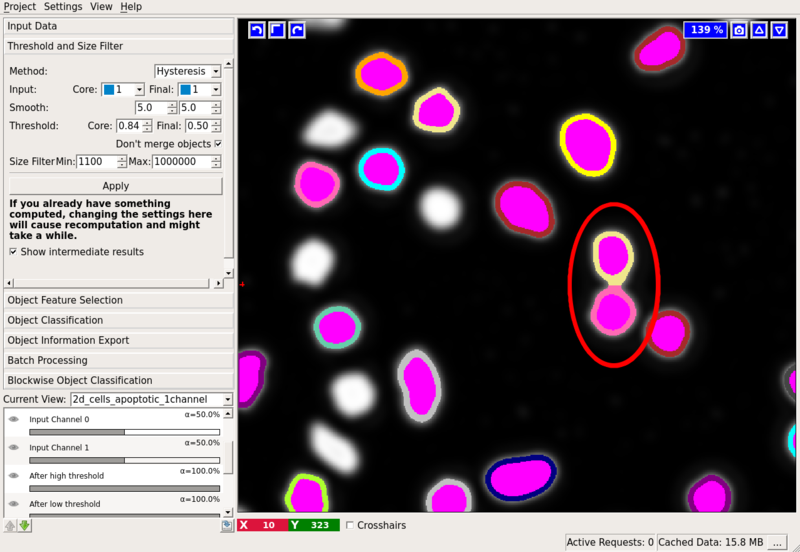 There are two ways to transform a probability map into a segmentation in ilastik and both are covered by the thresholding applet. To see the results of changing the parameter settings in this applet, press the “Apply” button. 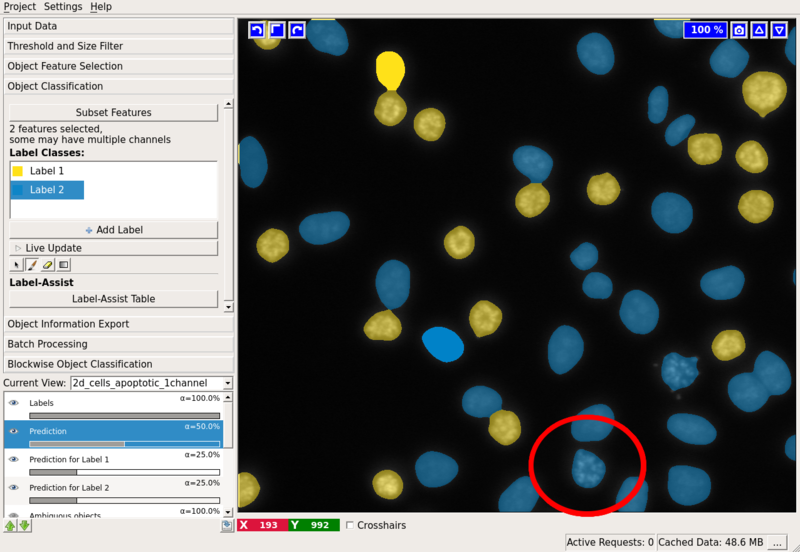 Now, two options are available for the actual thresholding, as shown in the little tab widget “One Threshold/Two Thresholds”. 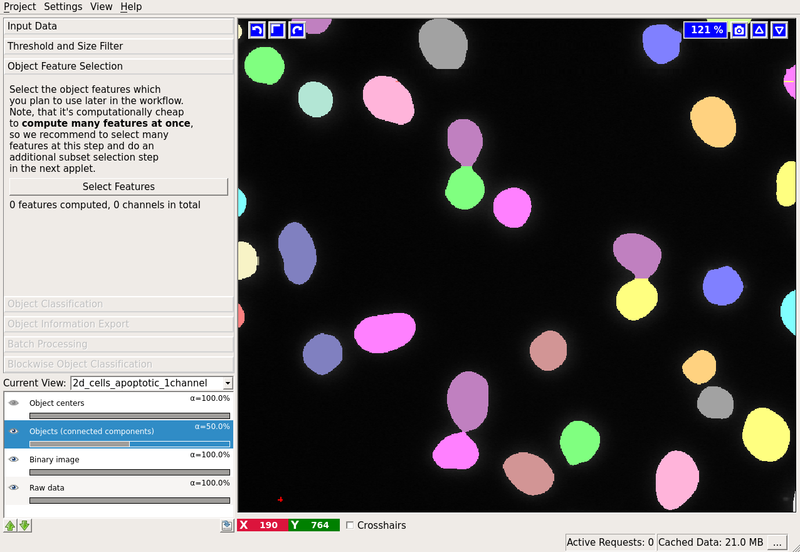 The “One Threshold” tab performs regular thresholding, followed by the size filter. 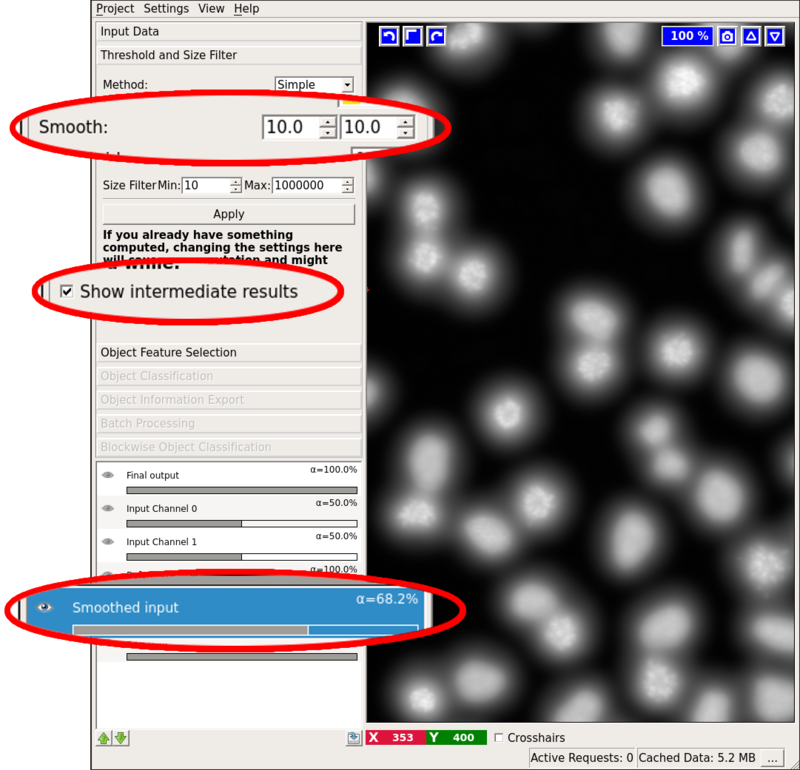 For debugging purposes, we also provide a view on the thresholded objects before size filtering. 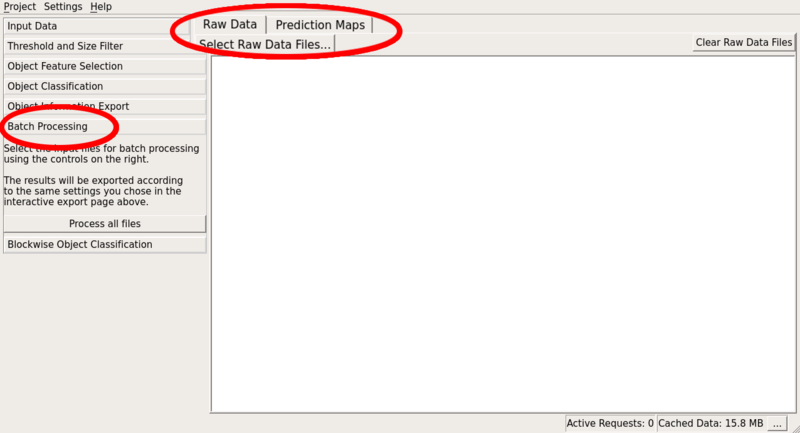 This layer is activated by checking the “Show intermediate results” checkbox. 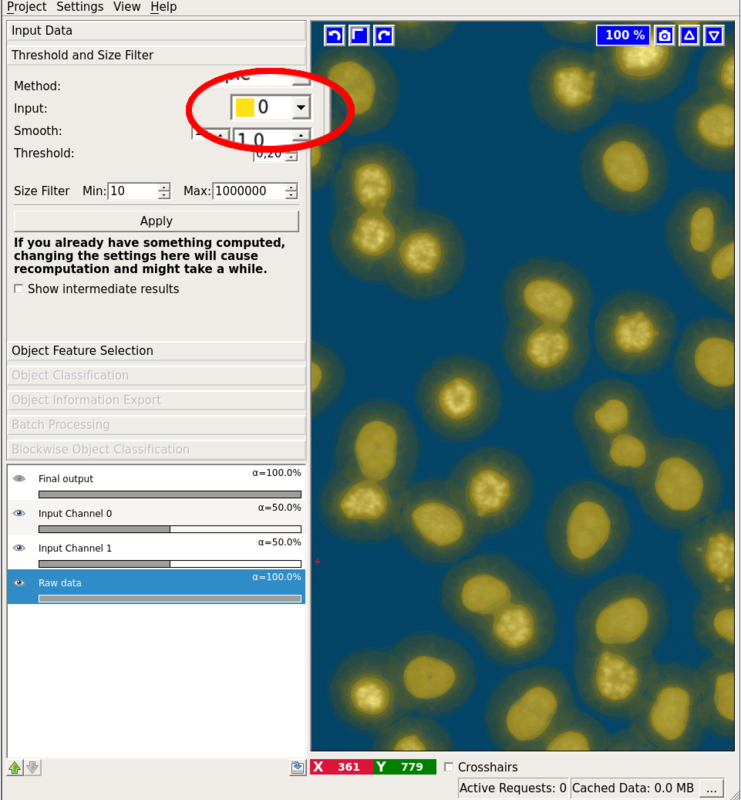 The last parameter of this applet is the size filter, for which you can specify the minimum and maximum value. 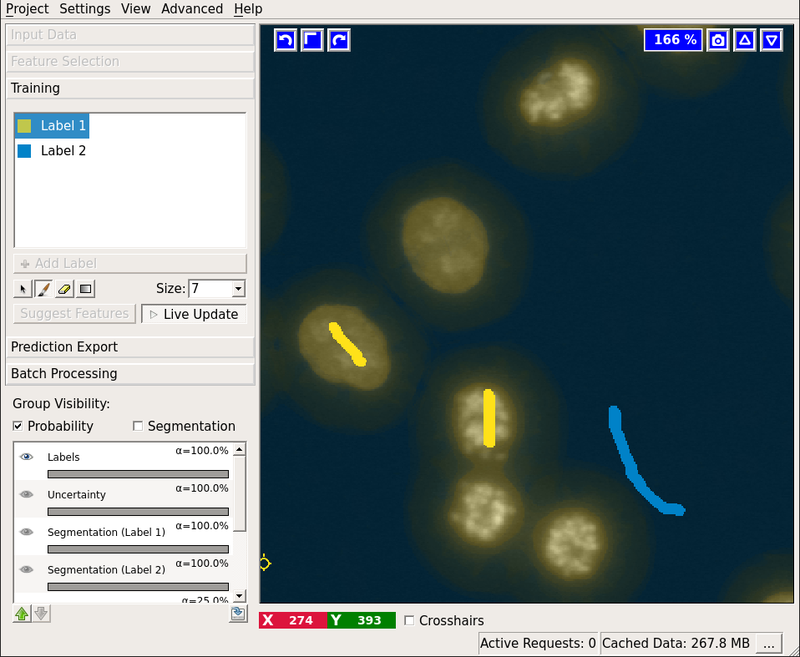 For both thresholding methods the end result is shown in the “Final output” layer. 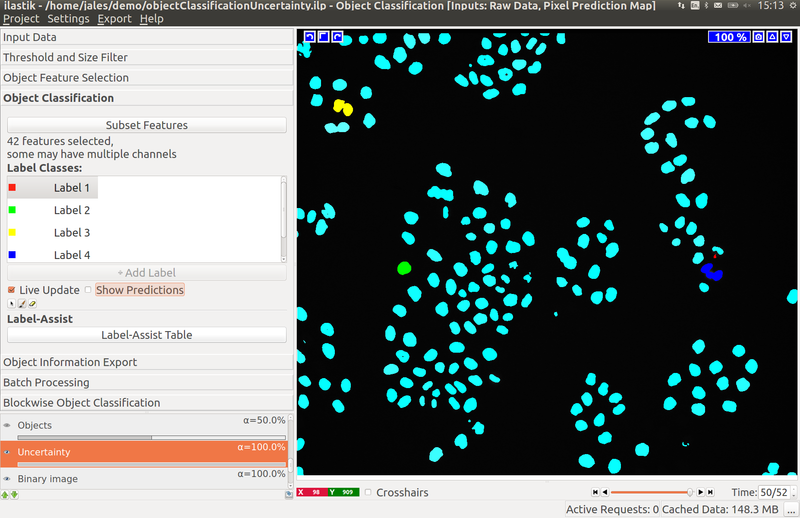 Now that we have obtained a segmentation, we are ready to proceed to the “Object Feature Selection” applet. 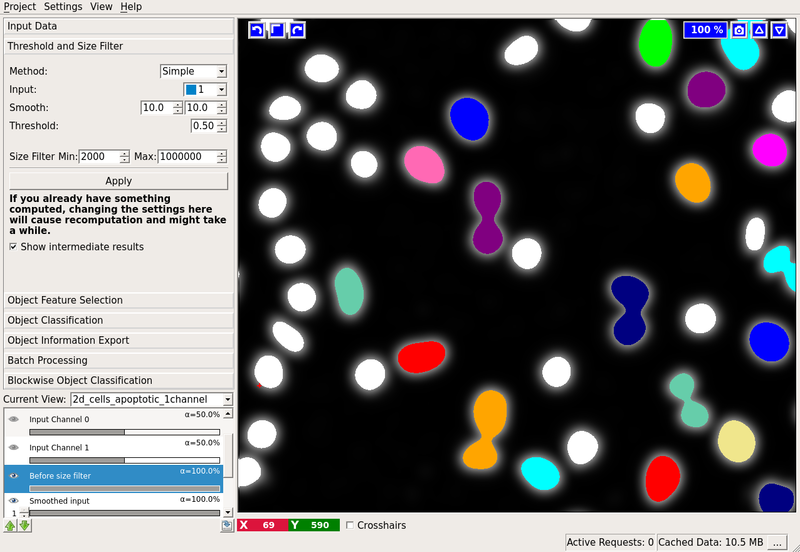 This applet finds the connected components (objects) in the provided binary segmentation image and computes user-defined features for each object. If you want to inspect the connected components, activate the “Objects (connected components) layer. 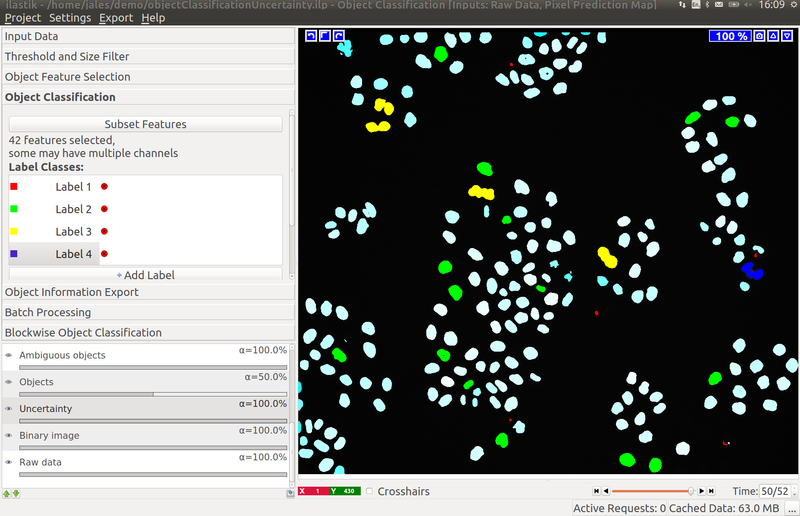 If you select any object features, connected component analysis will be performed automatically. 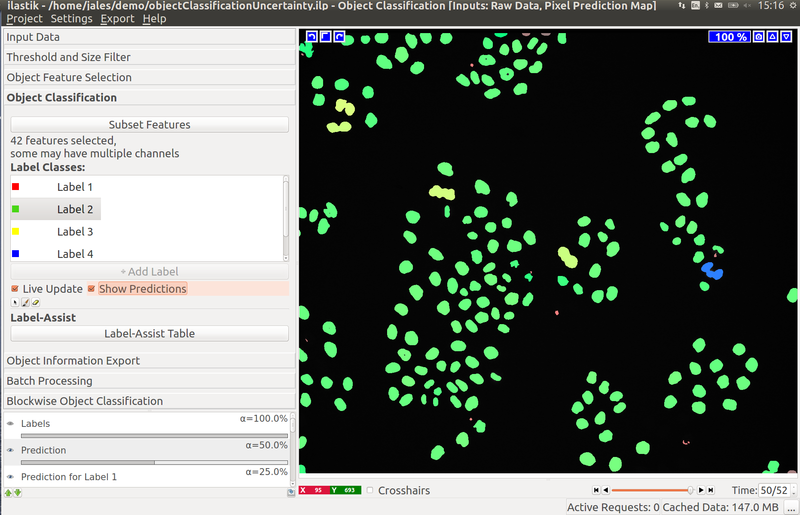 The “Standard Object Features” refer to the built-in ilastik features, computed by the vigra library. Unless otherwise specified by the “Coord” prefix, the features are computed on the grayscale values of the pixels that belong to the object. You will also notice features, which can be computed “in the neighborhood”. 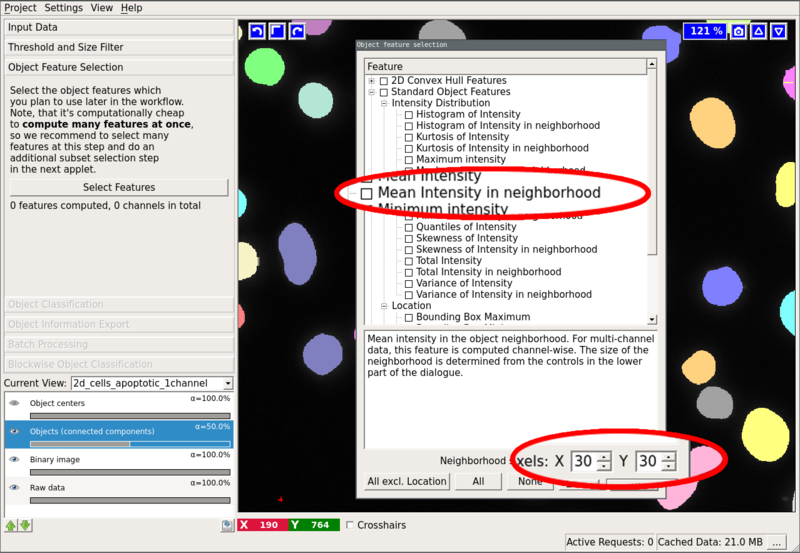 In that case, the neighborhood of the object (specified by the user at the bottom of the dialog) is found by distance transform and the feature is computed for the object itself and for the neighborhood including and excluding the object. Need more features? Object features are plugin-based and very easy to extend if you know a little Python. A detailed example of a user-defined plugin can be found in the $ILASTIK/examples directory, while this page contains a higher-level description of the few functions you’d have to implement. Once you have selected the features you like, the applet will proceed to compute them. For large 3D datasets this step can take quite a while. However, keep in mind that most of the time selecting more features at this step is not more expensive computationally. We therefore recommend that you select all features you think you might try for classification and then choose a subset of these features in the next applet. 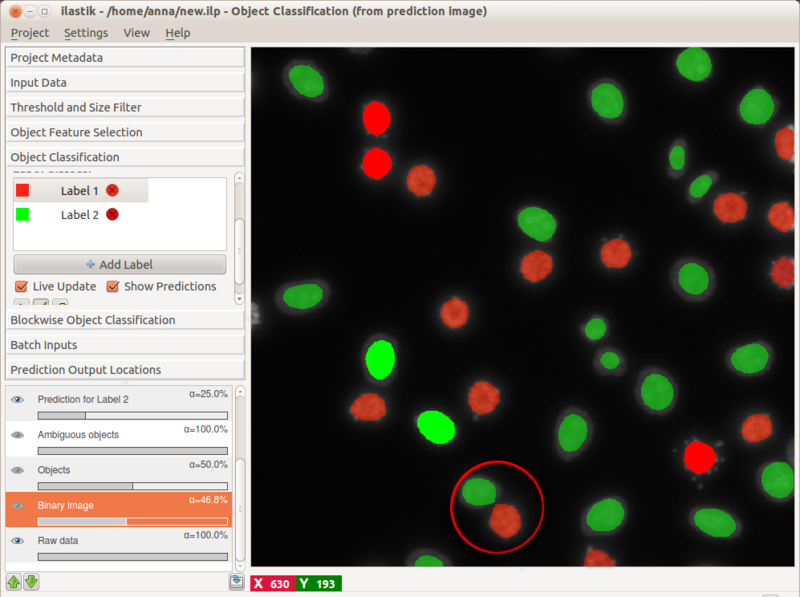 Clearly, two classes of cells are present in the image: one more bright but variable, the other darker and more homogeneous. 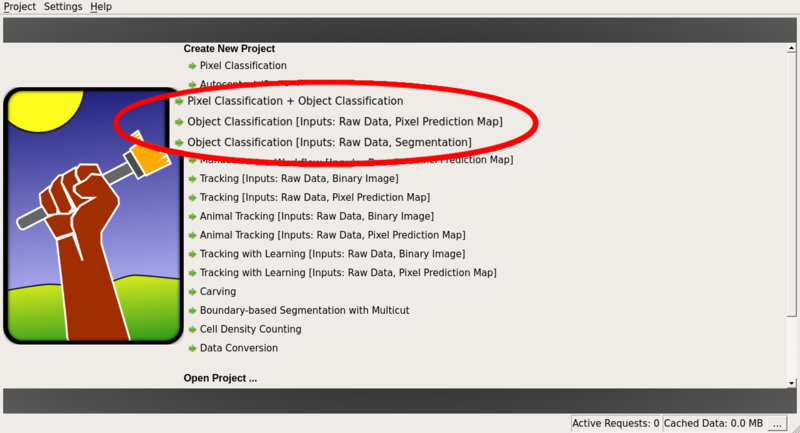 Hopefully, the two classes can be separated by the grayscale mean and variance in the objects. Let us select these two features and add two labels. Note, that the list of features now only contains the few features that were selected in the previous applet. 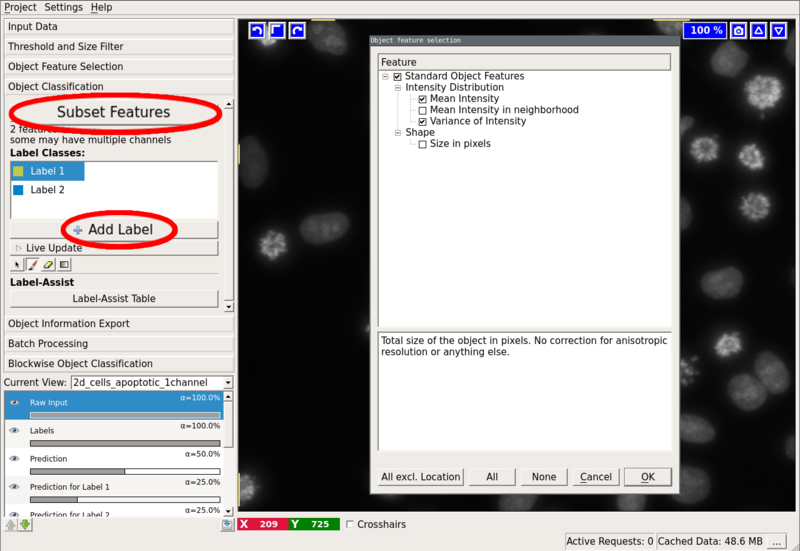 To label objects, either simply left-click on them or right-click and select the corresponding option. Right-clicking also allows you to print the object properties in the terminal. To trigger classification, check the “Live Update” checkbox.